The icy wind blasted our faces as we left the hostel for another 5-hour trek along the High Trail. This was supposed to be the easier part of the trail, but after walking halfway down the village road, a local informed us the trail was back up at the top of the road. Not the best start. We followed the trail as it hugged the mountainside and unexpectedly encountered a herder with his flock of goats coming the other way. The goats eyed us curiously. The took the inner part of the trail, we took the outer, and we passed by without incident. After two hours, we arrived at Halfway Hostel, which purportedly has the world’s most beautiful view from a toilet. It is an open-air structure with a trough and a hose spurting water from one end. As you do your business, you can gaze at the craggy mountains, sheer cliffs, and terraced farmland (perhaps not so romantic but quite beautiful). Back on the trail, the cliffs became more sheer, and in some spots, if we had slipped or fallen, broken bones would be the least of our worries. I had read that several hikers had died on the trail but tried to suppress that unsettling fact. Several times we walked across streams on the trail formed by waterfalls above us. Glad it wasn’t rainy season here. As we continued our trek, the suns’ rays, which were obscured by the mountains, began to beam shafts of light over the peaks until the whole valley was bathed in light. It was like opening your curtains in the morning on a brilliantly sunny day. Toward the end of the trail, we began descending to our last village. We heard goats bleating incessantly until we saw them scattered over the hillside, chewing leafy branches and bushes and fearlessly perched on rocky ledges. They were the real mountain climbers. At last we arrived at Tina’s Guesthouse, the official end of the trail and our bus transport back to the city. 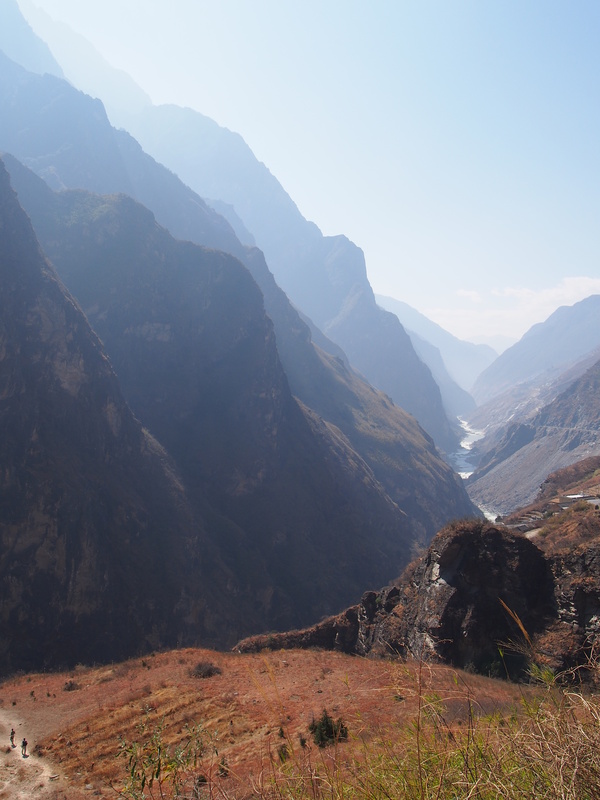 But we had one more thing to do – hike down to the river at Middle Tiger Leaping Gorge. After paying 15 RMB ($2.50), we walked down countless steps and passed multiple rest stations on the way. At one point, we were backed up by a tour group who were individually climbing down a ladder while one of them snapped pictures of the others at the bottom. They kindly let us pass them. Harry decided to rest at a station toward the bottom of the trail and told me to take pictures for him. I followed the sound of the roaring, thundering waters. These rapids were not for a leisurely rafting trip. They would forcefully drag you into their depths, bash you against the rocks, and spit you back up again. This was a wild, untamed river. And I was content to watch from a distance. The gorge was achingly beautiful with sheer rock cliffs on both sides of the river, towering to the heavens, and sunlight kissing the tips of the crags. I could have stayed here forever, but we had a bus to catch. Climbing down steps is fun. Climbing up them is anything but. The steps seemed to get steeper as we went, and we rested often. At one point, we climbed up a 10m (30 ft.) ladder. Later Harry told me his arms and legs were shaking while he climbed it (Glad I found that out later). After we got back to the road, we still had an hour left, and I was infected by mountain fever. There was one mountain I had seen near the end of our trail. It had brown, dry grass on its slope leading up to massive boulders and a square, table rock on top. Harry thought I was crazy to climb again. But I figured this was my only chance. The first part was steep but not too intense. Once I reached the boulders, the mountain rose much more steeply and the sides seemed to drop off into nothingness. The wind whipped across the valley and pummeled me. I felt exposed and vulnerable. But I made it to the table rock. In my hurry to get back down, I missed part of the trail and nearly wandered into a barbed wire fence before scrambling down a rocky gully and following the goat paths down the mountain. I made it back 10 minutes before the bus left. The bus took us along the road with cliffs on the right side and sheer drops on the right. For some reason, there weren’t many guardrails. We made it back to Lijiang and consumed hearty, black chicken soup with some vegetables before returning to the hostel and collapsing onto a red couch near the wood-burning stove. I already missed the trail.